A lot has changed since my last family travel post - Dusty is now eight months old and he’s become quite the traveller. We’ve been lucky to show him our slice of the world on the Sunshine Coast, as well as some of our favourite parts of Queensland and New South Wales in Australia, including Byron Bay, the Gold Coast, and most recently Fraser Island. So much has happened in Dusty’s world; sleeping routine changes, vaccinations, teething, formula amount changes, introducing him to solids, and more. It’s been the most amazing ride, but it’s also been wild to say the least! I feel like Jason and I have learned so much over the last eight months and being able to watch Dusty shine, and grow, and become curious, is truly the most magical part of it so far. What we have learned about travelling with Dusty is that our planning and preparations has been different. This is because there are different things to factor in depending on his age. 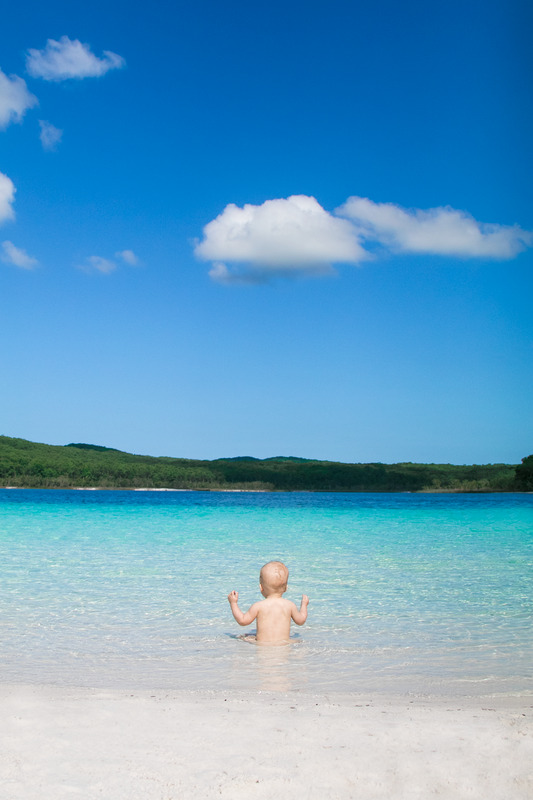 When Bubs Australia recently asked me to share my tips for making travelling with infants easy, I knew my trip to Fraser Island would be a great opportunity to share what we learned. Oh, the joys of breastfeeding! I had all those cosy mum-to-be visions that I would breastfeed at least for the first six months. Well...when Dusty was only three weeks old I got triple mastitis and ended up spending four days in hospital with a fever of 41 degrees. At one point, I honestly felt like I was going to die - it was really scary. After this experience, I decided to put Dusty onto formula full time. Thankfully I had the amazing support of Jason, my family and my friends, and Dusty - he was happy with breastmilk and formula so I feel very blessed he's such a chilled out little bear. So if you travel for a long weekend, usually a full tin of formula, a few bottles (we take about 6) and a mini kettle if the hotel doesn’t have one is all you'll need. We introduced Dusty to solids at four months and it was such an exciting time, prepping and pureeing all the vegetables and fruit he was allowed to eat. Progressively, we’ve been able to introduce lots of variety in his diet. However, travelling and feeding an infant can be difficult. We haven’t always had access to fresh fruit and vegetables, or a kitchen to prepare his meals. 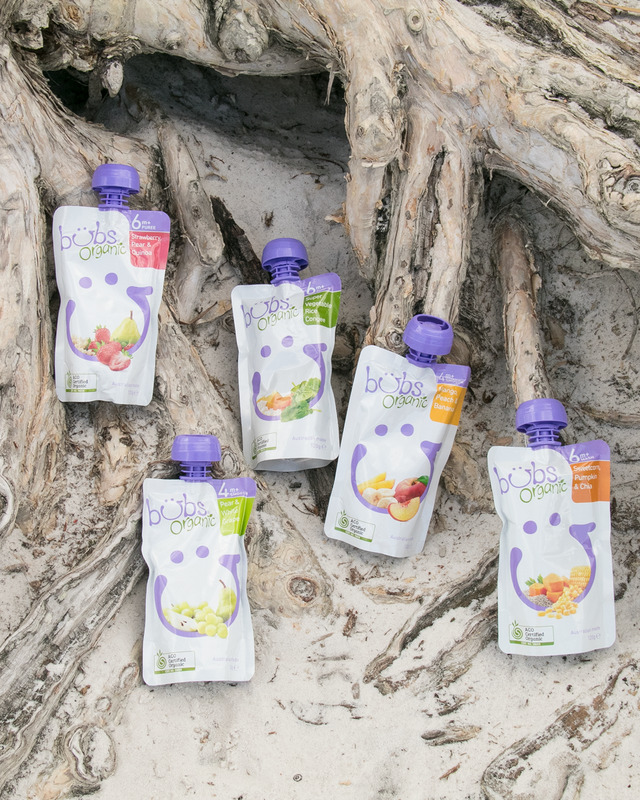 And that’s when we were introduced to Bubs Australia organic baby food by a friend. I’d always shied away from feeding Dusty packaged food as those little glass jars looked terribly uninviting and full of preservatives. However, when I actually took a look at the ingredients when I was in Coles at Noosa a few months ago, I couldn’t believe my eyes – the ingredients consisted of fresh, organic fruit, vegetables and grains. We are parents who both work full and also happen to travel a lot with Dusty, so I knew Bubs would be a lifesaver! - Breakfast: Bubs Baby Oats Cereal with the Bubs Blueberry, Banana and Quinoa superfood pouch. - Lunch: Sweet Potato, Carrot and Pumpkin superfood pouch and then Mango, Peach and Banana superfood pouch as his dessert. - Dinner: Super Vegetable and Rice Congee superfood pouch and then Pear and White Grape superfood pouch as his dessert. - Bubs Toothy Rusks: Parents everywhere in Australia are eternally grateful for these. The ones by Bubs have been specially designed for teething babies to help soothe their tender little gums. Their hard-baked rusks are made from a trio of organic multigrain and pure organic apple – and Dusty always has one in his hands. It’s adorable! I’m not going to give you any tips about sleeping because every family is different; some infants will be in their own sleeping routines (like Dusty) and some won’t. But a tip I would love to share is to keep your infants as busy as possible. Whatever it is, crawling in the sand at the beach, running around the hotel room in their activity walker, seeing new sights and touching new things with different textures, all of this will ensure that when they do sleep, they’ll have the best sleep.